Main facts: 10 June 2016 01:04:38 PDT, (33.432, -116.443), depth 12.3km, 20km NNW of Borrego Springs, California. 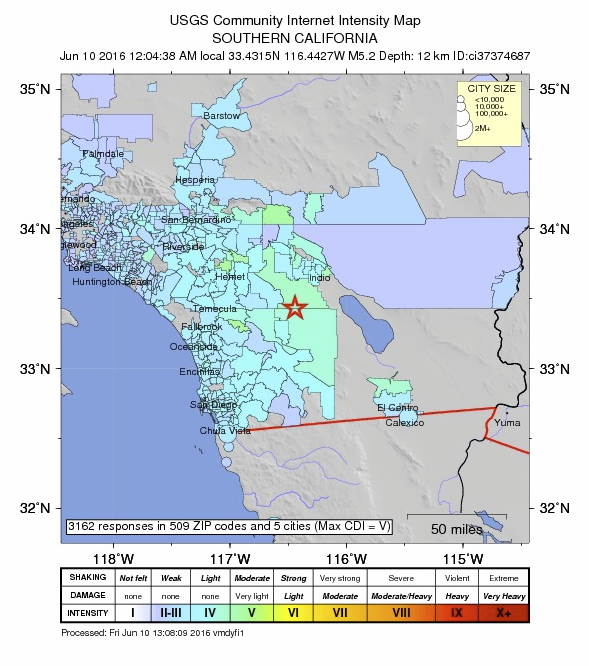 The ground shaking from ShakeMap (instrumental intensity) in the epicentral area was slightly higher than the reported felt intensities from Did You Feel It. DYFI (felt) intensities (top) and instrumental Shake map intensities (bottom). 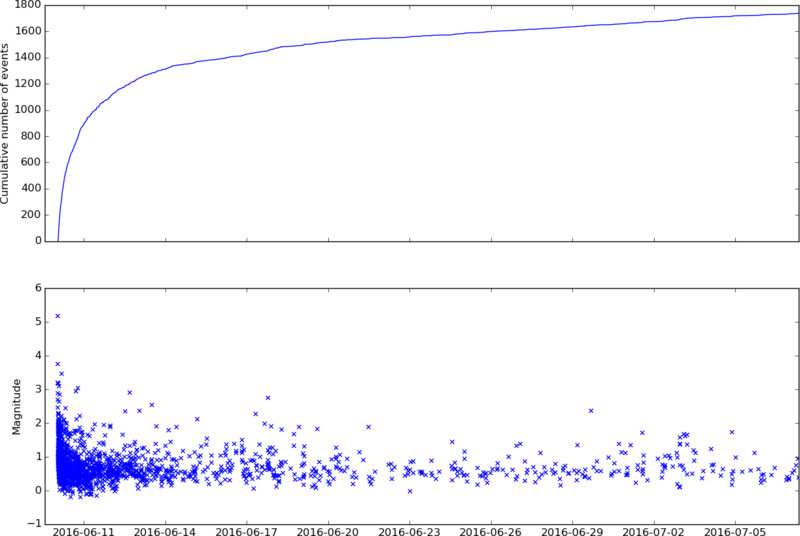 Cumulative aftershock count against time, and magnitude-time distribution of aftershocks. 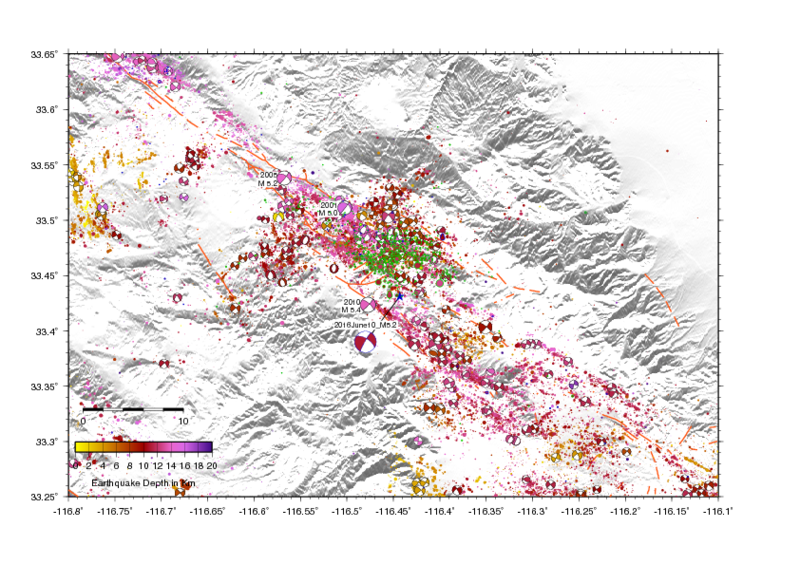 Catalogue aftershock locations shown coloured by time (blue early, red late) and sized by magnitude. The mainshock is shown by the red star. Historic seismicity above M4 (since 1932) is shown as black stars with the magnitude marked. Fault traces are shown in grey. Preliminary relocation using HypoDD with a 3D velocity model. The largest dot is the M5.2 mainshock. The USGS fault map is shown in the background. Since our records began in 1932 we’ve had 24 events of M4 or greater within 10km of today’s event, the largest was M5.4 (2010/07/07) and the most recent was M4.7 on 11 Mar 2013. Seismicity on the SJF showing the 2016/06/10 mainshock as a blue star, aftershocks to circled in green, events in the week prior circled in blue. All events are coloured by their depth according to the scale shown, and magnitude denoted by size. Focal mechanisms are shown where available showing predominantly right lateral strike slip, with some thrust mechanisms. Fault traces are shown in orange. Figure courtesy of J. Polet. Historical events along the SJF. 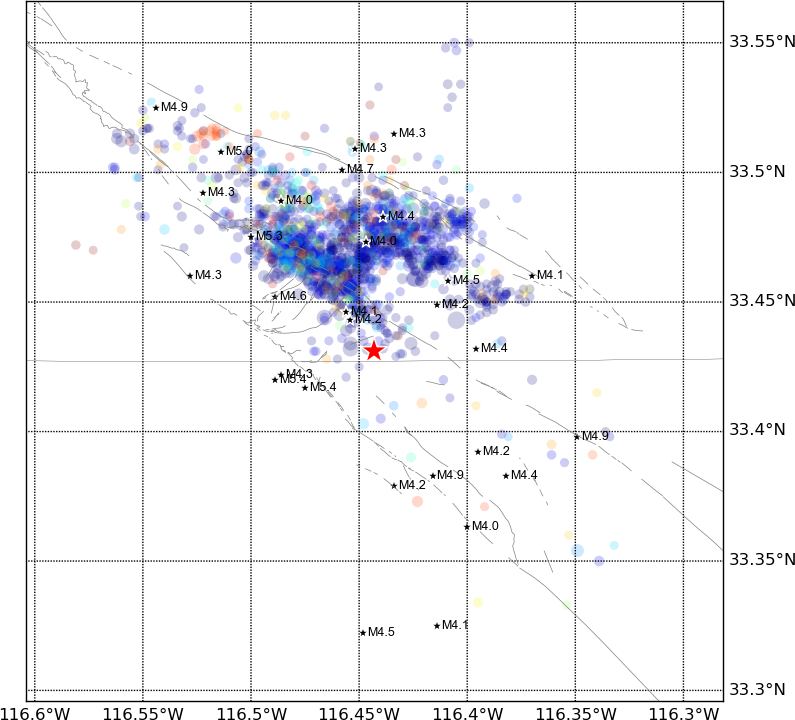 The Mw5.2 event was located close to the Ml5.34 1980 event. Nearby faults: San Jacinto fault (SJF) zone, Anza section (0.6 km). 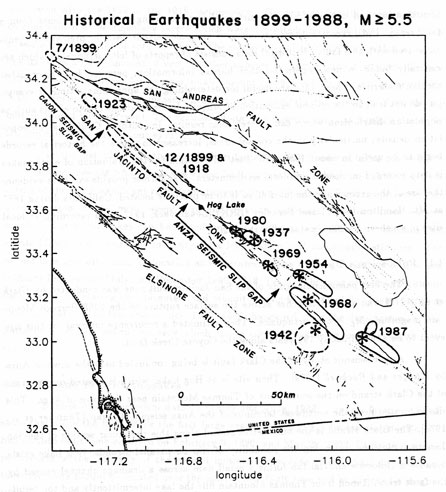 The San Jacinto is a right-lateral, strike-slip fault, consistent with the moment tensor of this event. 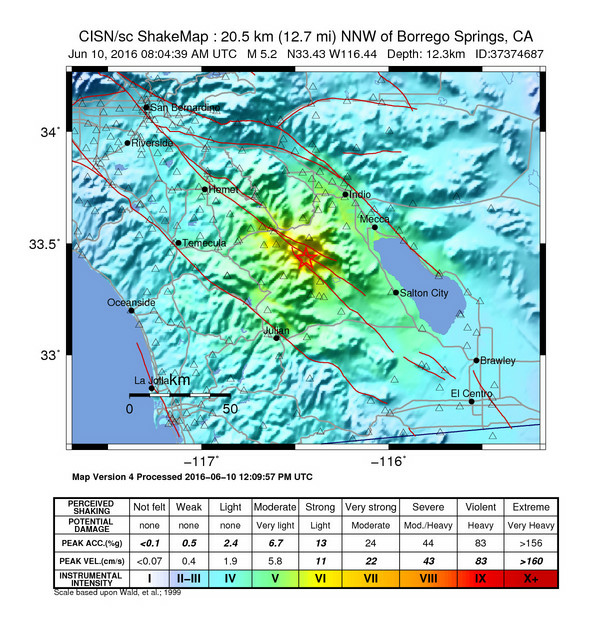 The event occurred in close proximity to the Clark fault strand of the SJF at about 12 km (7.5 mi) depth. For this magnitude and depth, surface rupture is not likely so a definitive association with a specific fault strand is not possible at this time. Field surveys will be conducted to investigate the possibility of surface rupture. Spectra of the mainshock suggest rupture to the northwest but the rupture could be mostly bilateral. Version 2: This report supersedes any earlier probability reports about this event. Most likely, the recent mainshock will be the largest in the sequence. However, there is a small chance (APPROXIMATELY 5 TO 10 PERCENT) of an earthquake equal to or larger than this mainshock in the next 7 days. In addition, approximately 1 to 12 SMALL AFTERSHOCKS are expected in the same 7-DAY PERIOD and may be felt locally. This probability report is based on the statistics of aftershocks typical for California. This is not an exact prediction, but only a rough guide to expected aftershock activity. This probability report may be revised as more information becomes available. Like most earthquakes, the recent earthquake is expected to be followed by numerous aftershocks. Aftershocks are additional earthquakes that occur after the mainshock and in the same geographic area. Usually, aftershocks are smaller than the mainshock, but occasionally an aftershock may be strong enough to be felt widely throughout the area and may cause additional damage, particularly to structures already weakened in the mainshock. As a rule of thumb, aftershocks of magnitude 5 and larger are considered potentially damaging. Aftershocks are most common immediately after the mainshock; their average number per day decreases rapidly as time passes. Aftershocks are most likely to be felt in the first few days after the mainshock, but may be felt weeks, months, or even years afterwards. In general, the larger the mainshock, the longer its aftershocks will be felt. Aftershocks tend to occur near the mainshock, but the exact geographic pattern of the aftershocks varies from earthquake to earthquake and is not predictable. 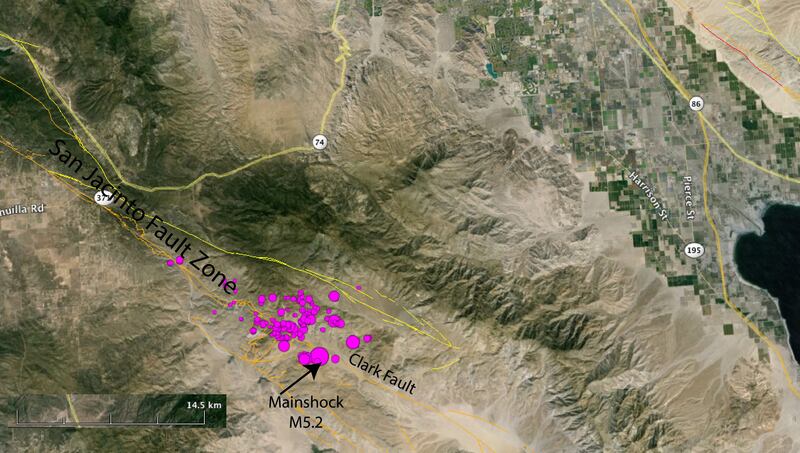 The larger the mainshock, the larger the area of aftershocks. While there is no “hard” cutoff distance beyond which an earthquake is totally incapable of triggering an aftershock, the vast majority of aftershocks are located close to the mainshock. As a rule of thumb, a magnitude 6 mainshock may have aftershocks up to 10 to 20 miles away, while a magnitude 7 mainshock may have aftershocks as far as 30 to 50 miles away.